Boxing Scotland hopes its efforts to improve training and competitive opportunities for the country's female fighters will be rewarded with a medal at the Gold Coast Commonwealth Games. The Livingston-based governing body was criticised last year by some female boxers for what they perceived to be a failure to invest in their development. But the Equality Human Rights Commission has praised its progress. And Stephanie Kernachan has won Scotland's first women's British title. Alastair Pringle, the national director for the Equality Human Rights Commission in Scotland, told BBC Scotland that once the matter of development opportunities in women's boxing was raised with them, they had a "very constructive discussion" with Boxing Scotland who "agreed there was probably more that they could be doing". "We entered into discussion with them and agreed some initiatives which would lead to greater access and opportunities for Scottish women who wanted to box," said Pringle. "The issue of women's boxing is fairly new in Scotland and, if you look at the whole of the sporting infrastructure in Scotland, women are under-represented from the board to the winning podium. "In 2013, there were no female training sessions being held and I think from 1 January this year there have been eight, with 45 women and girls attending training sessions. "I think there are just under 100 females registered with Boxing Scotland, which is their highest ever number, so definitely the work that they have done has led to some improvements." Cleland Boxing Club's Kernachan, who won the GB Elite Championships in May, has been boxing for nine years but has noticed significant changes. She said: "Three years ago there was nothing - no funding, no opportunities, no high performance camps - but now that we've secured a bit of funding [from sportscotland] we're getting the regular sparring and training and now we're going to tournaments and training camps. "Before it was only a dream to go to the Europeans, the Worlds, but now we're part of the development programme we are training with the boys that competed at the Commonwealths, that have medalled at the Worlds. "The programme makes you feel you can accomplish what you want to go for." Kernachan was one of a group of Scottish female boxers to attend a recent conditioning camp in Portugal organised by Mike Keane, the national coach, who puts the boxers through their paces once or twice a month at the high performance centre in Glasgow's Bridgeton. Last year he felt there were no female boxers with enough competitive experience to offer a medal chance for the host country at the Commonwealth Games in Glasgow but believes it will be a different scenario in three years' time in Australia. "We're working really hard to get them up to a level that gives them opportunities to go to tournaments and train with other nations' boxers," said Keane. "Some of them have been boxing at the same club for years and they've only had four or five bouts because there isn't the opposition. "We're preparing to send a team of eight to 10 to a camp in Sheffield, which will have English and Welsh boxers in it. "Our target is for a minimum of one medal at the Gold Coast." His confidence is echoed by Fraser Walker, Boxing Scotland's chief operating officer. He told BBC Scotland: "There wasn't a development programme for the females in place for [Glasgow 2014]. Now they are in this fantastic, world class facility [in Bridgeton], they are getting the best training. 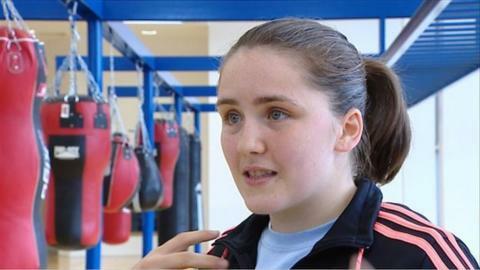 "We'll have boxers who will be there or thereabouts for medals in the Gold Coast."